Multiplayer Week continues! Playing with multiple opponents is my favorite form of Magic. In fact, I'm pretty skilled at playing politics and making friends in multiplayer. That last bit is sarcasm. What I'm actually good at is making everyone want to take me out. I do that in a variety of ways, but my favorite is to just destroy everybody's stuff (including their hands and libraries). We already printed a few Arcana articles about board-destroying effects (sometimes called "board wipes," "sweepers," or "wrath effects") during Annihilation Week, including a quiz, pro-level sweepers, and R&D notes. What we didn't do was look at art descriptions, so here are some from a variety of recent cards that mess with your opponents'…anythings. Action: This spell calls down a massive, branching blast of lightning from the sky. It crackles and branches off in a crazy, interesting shape as it travels down toward its target. 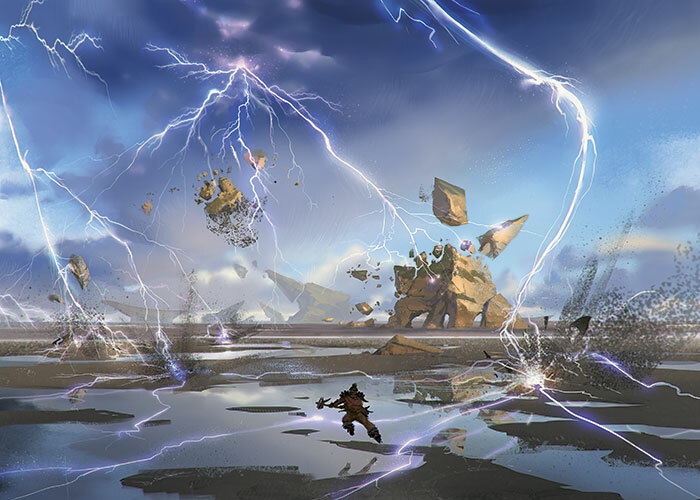 Show a Temur warrior, relatively tiny in the frame, about to be struck by this massive blast of lightning. Jagged branches of electricity arc in every direction. Action: This is a devastating spell that an Abzan mage conjures that leaves everyone dead but herself. 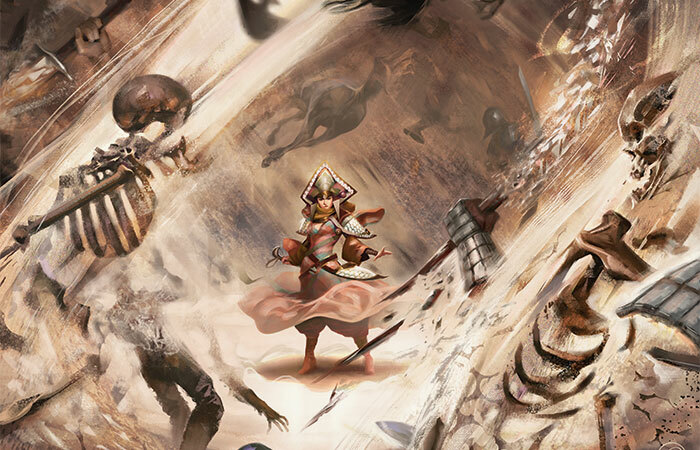 Show a female human mage of the Abzan surrounded by a magical, tornadic swirl of sand and dust. She's in the middle of the desert, blasting sand outward from herself, as if she were the eye of the storm. We can see indications of blasted skeletons in the swirl of sand—she is killing several, maybe dozens, of enemies with her one massive sandstorm. Mood: This spell is one of the Abzan clan's most devastating weapons. Action: A huge dragon rears up in front of a wall of a seemingly impregnable castle. It beats its wings to stay aloft, its head at the height as the top of the wall. 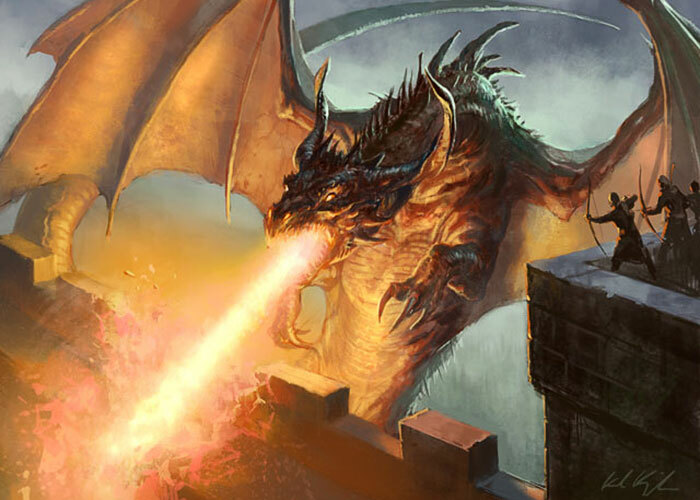 The dragon is breathing a torrent of flame at the wall, which is clearly melting into slag. Guards on the wall scurry away from the blast. The dragon is a deep red. Perhaps this is from a guard's POV. Location: Outside a cave mouth carved into a basalt cliff-face. Action: Show a siren who is now one of the Returned. She is perched outside the cave mouth. 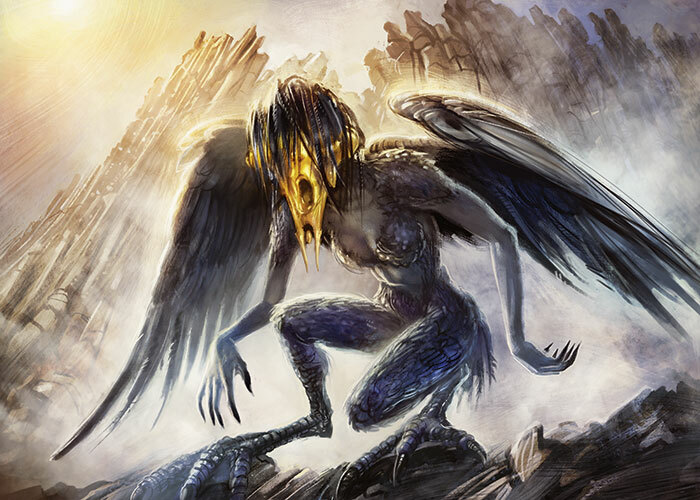 Maybe the rigid, gold mask has a frozen face that represents singing, an ironic remnant that has accompanied her into the joyless existence of un-death.